With the increased prevalence of electronics, such as computers, smartphones and tablets, in our everyday lives, more and more hours are being spent by most of us, either during our leisure time or for work, staring at a screen. While these technologies can be beneficial, for instance, in the amount of knowledge it grants us access to, or the increased amount of productivity it allows us, there are also many downsides to this increase in accessibility. Because of the difficulty of the eyes to properly focus on electronic screens, as well as the high amount of harmful blue light received from these devices, our San Diego Eye Care clinic is seeing a drastic increase in an eye condition known as Computer Vision Syndrome. 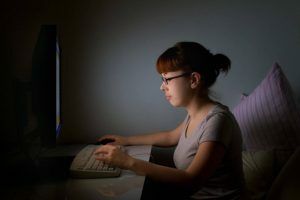 As much as 90 percent of all people who consistently work with computers suffer from Computer Vision Syndrome, and related symptoms, such as physical fatigue, decreased productivity and increased work errors. Minor annoyances, such as eye twitching and red eyes, have also been reported. Move your work space around a bit. With some minimal rearrangement, a new configuration in your work space can help your eyes more easily deal with strain associated with working all day on the computer. First of all, you should attempt to minimize how much light comes in from outside. This can be done by simply closing the shades. Also, if possible, your computer screen should be placed with windows to the outside off to the side, rather than behind or in front of it. Your eyes can become strained from bright sunlight that streams in through the window, and may cause your eyes discomfort, so setting the sunlight to the side minimizes the amount of light coming straight to your eyes or being reflected off the computer screen. Set your monitor settings to maximize comfort. Monitor settings, when set incorrectly, can make your eyes seriously uncomfortable. Our Eye Doctors advise that if you have an old tube-style monitor, you should get rid of it as soon as possible, since this style of monitor has a noticeable, uncomfortable ‘flicker,’ and likely gives off glare that contributes to computer eye strain. By contrast, LCD screens lack this flicker and very often include an anti-reflective surface. These are extremely important factors when trying to make computer use more comfortable on your eyes. Be sure to adjust your computer’s display settings correctly as well. Brightness, text size, contrast and color temperature all add to or diminish your experience. Finally, regular eye exams are an absolutely essential. Whether you are coming into our San Diego Eye Care Clinic for computer vision problems, a new pair of eyeglasses, or anything in-between, we are here to help! Those who work most of their days on the computer should have an eye exam before they start working, and every year after that, so that their eye doctor can keep track of changes, and treat symptoms as they are diagnosed. Also, speak to us about custom computer glasses to help deal with computer eye strain. Make an appointment with your San Diego Optometrist, today!